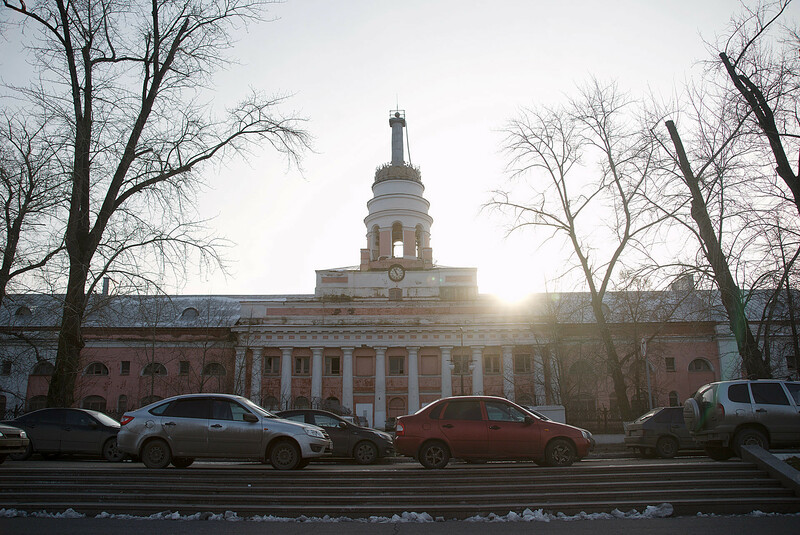 The capital of the Udmurt Republic is known for producing some of Russia’s deadliest weapons including the Bulava missile and Topol-M missile system. People say the city resembles a microchip and the locals live in a parallel world. Russia Beyond visited Izhevsk (1,200 km east) to see it with our own eyes. The mustachioed taxi driver bursts into laughter after mentioning the grandmothers. His fingers tap the steering wheel to the rhythm of Udmurtian rap. 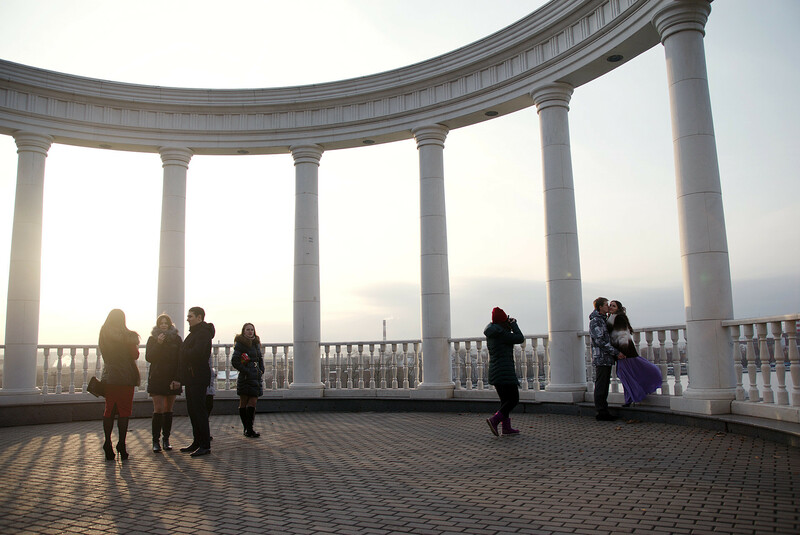 The Buranovskiye Babushki are the republic’s brand. In 2012 they participated in Eurovision with their song “Party for Everybody” and came second. Buranovo village is located 36 km from Izhevsk. The grandmothers are indeed “self-produced”: They have three groups. But the Kalashnikov still reigns supreme in these parts in terms of status. Little here alludes to the presence of the Udmurt people though - just the bilingual road signs. “Do you know that Steve Jobs is an honorary Udmurt,” the taxi driver asks me. Yes I know. Other honorary Udmurts are Kazimir Malevich, Emir Kusturica, Albert Einstein, and John Lennon. People say that somewhere in the city you can find extensions of their graves (with the exception of Kusturica) in the form of iron leaves on the ground. The honor was awarded for having a “special influence on Udmurtia,” but it’s actually just a result of Izhevsk artists fooling around. It was the same when the city’s residents erected a small copy of St. Petersburg’s Alexander Column, cast a small Tsar Cannon, and placed a portrait of the Romanovs by a cemetery entrance - although not a single Romanov is buried there. The car stops and the taxi driver winks conspiratorially. “Don’t pay any attention to it, everything here is…a bit surreal,” says Nikita. 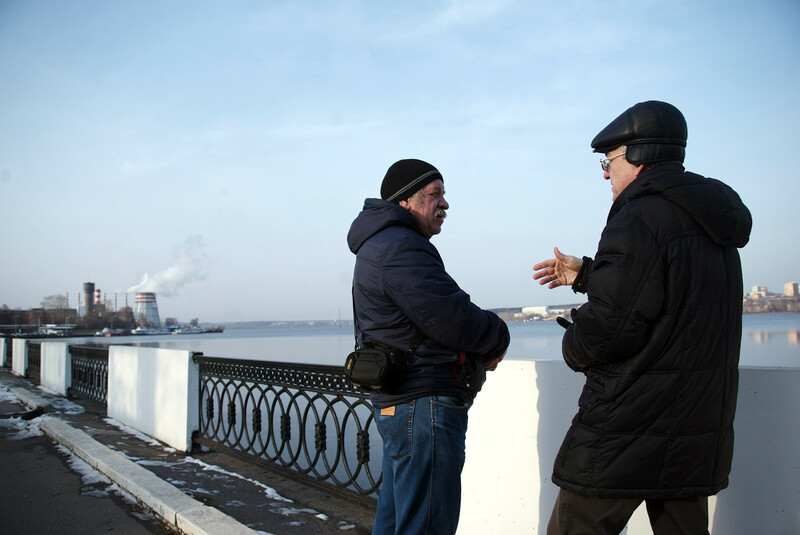 He’s lived in Izhevsk all his life and is shooting a documentary film about the republic. The Russian Drama Theater stands in Izhevsk’s historical center. It’s a three-story building with columns like those outside the entrance to Moscow’s central metro stations. The adjacent building houses another drama theater, showing only Udmurt productions. It’s smaller and without columns. “We don’t understand the difference between ourselves and the Udmurts. It’s obvious but it’s not clear where the border lies,” explains Nikita. In the past the Udmurts were called Botyaks because 40 km from Izhevsk lies the city of Votkinsk and the Votka River. Here the people are considered something like local Indians. 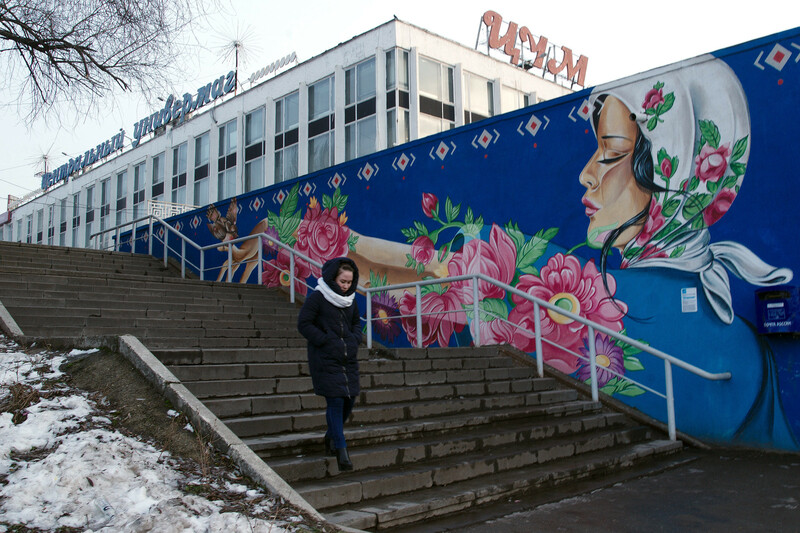 American artist Nanibah Chacon from New Mexico came to Izhevsk and spent two weeks painting a mural. It was a profile of a woman wearing a traditional Udmurt shawl (indistinguishable from a Russian one). The artist was amazed by the relation between the distant cultures: Elderly women from the Navajo tribe wear the same shawls. Obviously there is no Udmurt Reservation here. But there are elements that allude to it. During the Soviet Union Russians worked at factories as the qualified labor force, while Udmurts did the “dirty work” or were employed in villages. The local people were considered savages. During Joseph Stalin’s reign the word “votyak” became a pejorative term. Many were ashamed of their origins. But today, Nikita says, attitudes are changing. People are treated as equals. From the window of his 13th floor studio apartment the “progressive” district of Izhevsk looks like it can fit in your palm: Pipes, concrete, Factory smoke, a colorless sky. 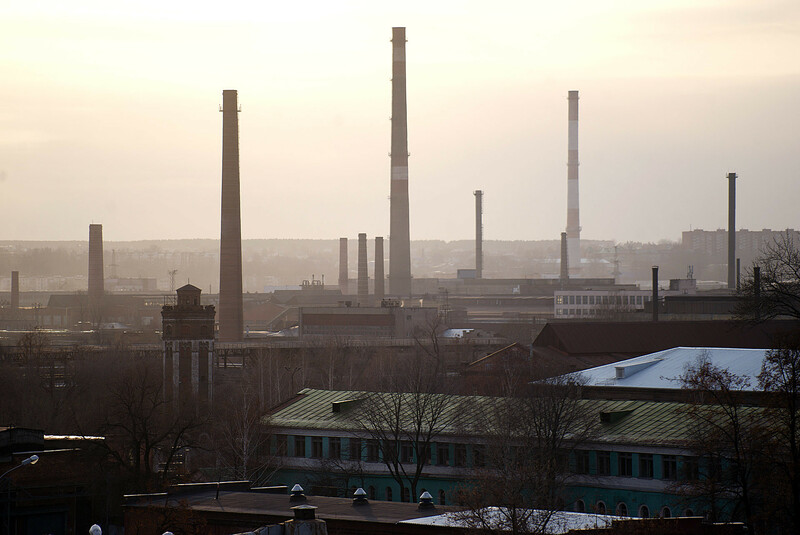 “Progressive” district of Izhevsk looks like it can fit in your palm: Pipes, concrete, Factory smoke, a colorless sky. A blinding light reflects from a large water stain. This is the Izhevsk Pond. 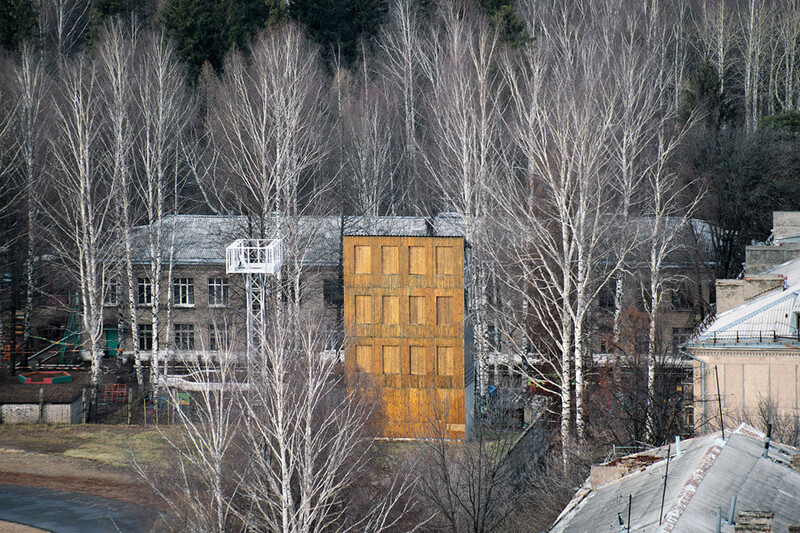 It was excavated by hand where the Yagul Udmurt village once stood during the Russian Empire in 1760, in order to build the city’s first enterprise – an iron factory. The old building with the shabby stucco still stands on the shore as a silent reproach to the authorities, who have no money for its reconstruction. In the winter practically no one walks around the pond. There are no mothers with carriages, no tourists. It is two o’clock in the afternoon and only two men and I are here. 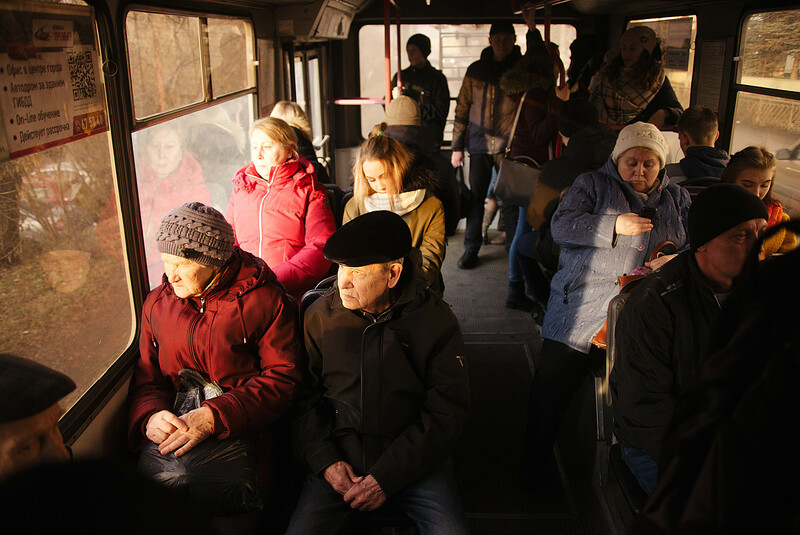 They are both pensioners who moved to Izhevsk more than 20 years ago. They were struggling to feed themselves and it was “just fantastic here.” The hungry times were the 90s: After the collapse of the USSR many factories closed down. The men find it difficult talking about it - they still resent the Soviet government...and the current administration. The hungry times were the 90s. The men find it difficult talking about it. Izhevsk wasn’t even hit that hard. It was saved by a large concentration of factories, some of which are still going. Those that were shut down have been turned into commercial centers - the same gray hangers simply house something else. Until the middle of the 80s there was no direct road connecting the city to neighboring regions. Because of the state defense industries, one could only enter with the special pass. The place was not secret enough to bear a code number instead of a name but tourists were still not allowed, unlike today. Travelers are attracted to the city’s ethnic character and its industries (tours of the plants are available). However, the locals are indifferent to the fact the city produces the most popular weapon in the world. “No one here really knows what this city actually produces. I’ve never really given it much thought… But actually, yes, this place has a lot,” says Kolya, a 27-year-old shop assistant. 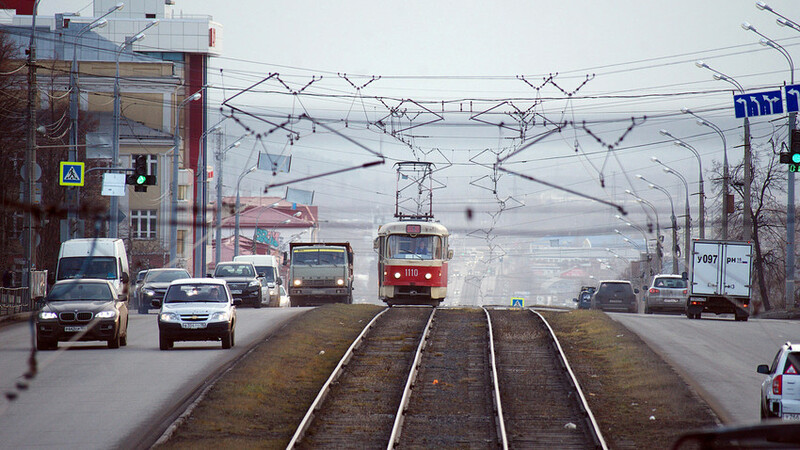 Starting in the 2000s Izhevsk residents were told that soon the city would have a million residents. But this has not happened. Currently, there are just over 646,000 people here. The shop assistant does not hide his disappointment. 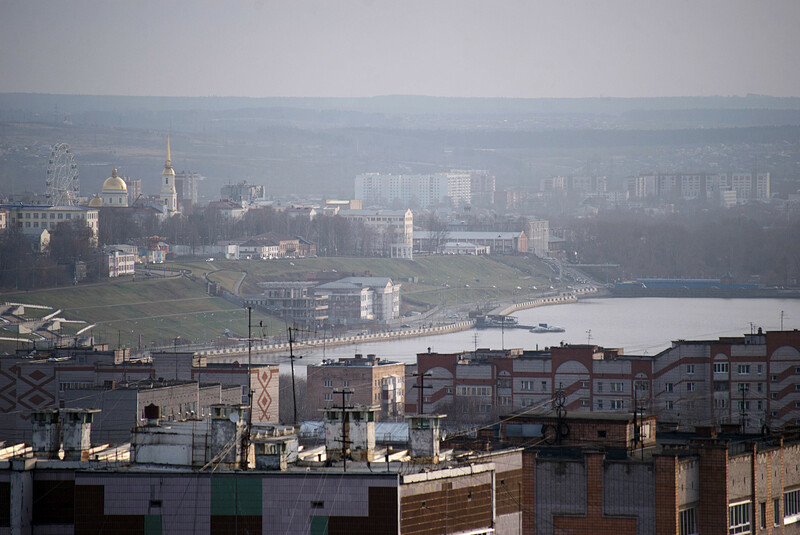 “It’s stale and dull,” this is what he thinks of Izhevsk. Next year he’s moving to St. Petersburg. You can hear the same type of talk among the students standing by the entrance of the women’s dormitory. In part this mood can be explained by the typical imbalance between the provinces and the capital in Russia. It is thought that all the best things are in Moscow and St. Petersburg. 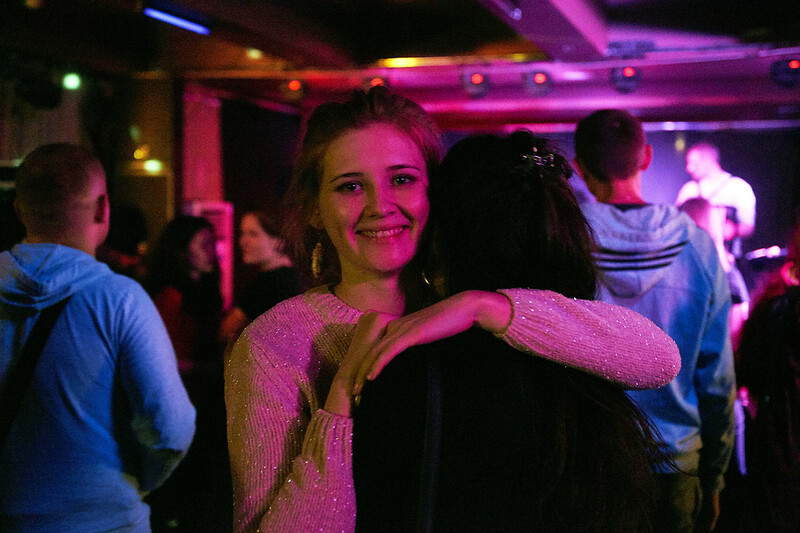 Many people feel Izhevsk fails to deliver as a city in terms of things to do, but Nikita thinks the place has an interesting internal cultural life. Currently, there are just over 646,000 people in Izhevsk. Between the middle of the 80s and the beginning of the 2000s there was a myth surrounding the city: “Izhevsk is the Russian capital of electronic music.” It had a few record labels, such as Kama Records (no longer around), about 50 groups, performances by DJs from England, the U.S., Germany, and Iceland. Despite the disappearance of the label, there are still many creative people here. “Everyone sits in their bedroom. Actually, this is very Russian: A musician who composes in the bedroom. Then he uploads it all into the Internet”. You can understand the people who want to leave the city. But some say they are happy here. You can understand the people who want to leave the city. But some say they are happy here. 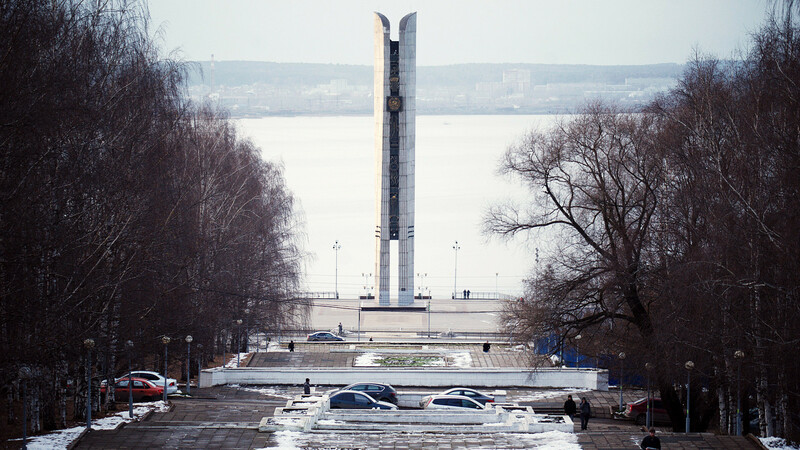 It’s just that Izhevsk can come across as a bland city. For example, you can be walking down a street and see nothing but high-rise apartment boxes, one after the other. Suddenly I see a sign on one of the buildings written in large letters: “This side up.” What does it mean? It means that people are very fragile, that they are not merchandise, says Nikita. I can imagine thousands of fragile people assembling machine guns and the country’s nuclear shield. And then they return to their concrete boxes and muse over who had a bigger influence on them: Native Udmurt and avant-garde artist Kazimir Malevich or distant Udmurt John Lennon. Russia’s Amazon warriors: Why are women joining the country’s military?